Yesware users love open events, but several of you have pointed out that seeing every single open event inside Salesforce can clog up the Activity History of a contact. The same will hold true for multiple Link Click events for the same message. 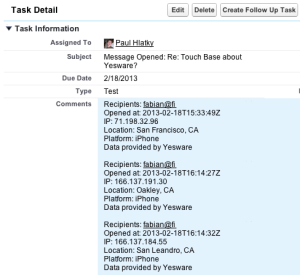 However, Replies will each continue to get stored in their own Salesforce tasks (as they always have). What does this mean for you? 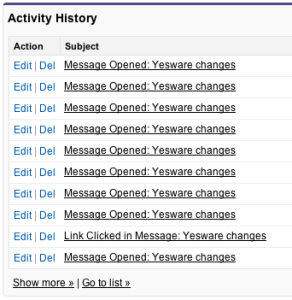 You’ll see a lot fewer Yesware open and link-click events inside Salesforce contacts, leads, accounts, and opportunities and inside Salesforce reports. But you can always get all the details for these by drilling into an individual task.